Equation Technologies has another option for companies already using Sage 300 ERP (formerly ACCPAC) and are looking at the possibility of moving to the cloud for cost savings, and ease of access and maintenance. The service offering is a cost effective solution for companies with existing Sage 300 product licenses. Pricing is on a per user, per month basis and is designed to offer all of the benefits of Sage 300 ERP at a very reasonable cost. The costs adjust based on the number of users and the specific features needed, but in any configuration the costs are fractional compared to maintaining the infrastructure and personnel needed to manage the solution in house. Complete pricing information can be found here. We know moving your mission critical enterprise data off premises is a complex decision partially due to concerns about data security, access and backups. Equation Technologies is a highly respected and trusted Sage Partner, and we take these issues very seriously. Client data is protected using stringent and secure computing architecture and compliance standards. We make sure you have complete control of your data even after your subscription ends. We have also built in routine scheduled backups so that there is always data redundancy. If you currently have Sage 300 ERP and your organization is considering the cloud, our unique offering blends the power of the product with unmatched data security, included support and our world class Sage consulting team. 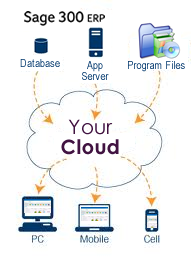 Contact us to see how we can make the cloud work for you.